Tired of a lame fart app for your mobile? Look no further! Joe Farts is your premier fart application for webOS. Beware, if your afraid of toilet humor, or find South Park offensive, this app may not fit your fancy. But if a good old gross fart makes you smile, this one is for you. Featuring 21 fart sounds and a handy timer to hide your phone and unleash an un-expected fart on a person. 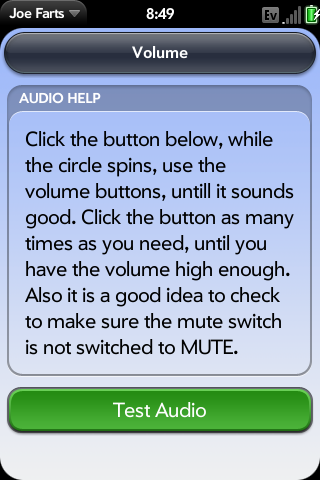 While pressing your farts you will be able to turn on and off the vibrate mode on your phone. 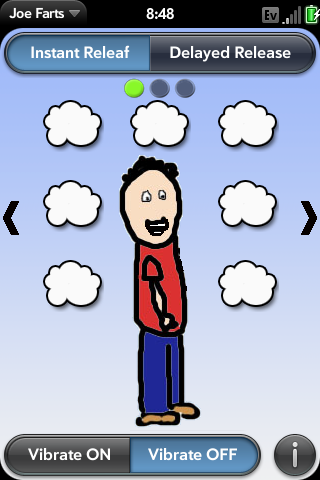 As you press a fart sound, our key character named “Joe” does a special pose for you as he passes gas! Joe Farts also provides a quick information page about those pesky farts! Oh and hey, feel free to send us your own fart sounds! We would be happy to add them! As always if you have any problems, bugs, or feature requests please EMAIL us and let us know, please do not leave a negative comment to share issues or feature requests. Thanks!